Once you're ready to get started, you'll need to prepare a rag by dampening it and applying a little soap. Next, slightly dampen another rag to wipe any soap residue from the leather. 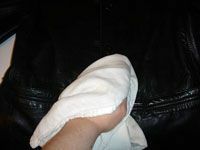 Use a dry rag to remove the light film of excess water that may be on the surface of the leather after rinsing. 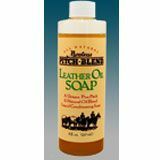 Finally, you should always condition leather after cleaning, since the soap will have removed some of its natural oils. Most of the time when you clean leather, you simply need to avoid drying it out or changing its appearance. With these concerns in mind, you can spend a lot of money on leather cleaning products. But if you’re working with finished leather, which has a slight sheen and is the type you see most often on jackets, boots, and furniture, you can use a couple of products you probably already have on hand. They’ll do just as good of a job, cost you next to nothing, and free you from worrying about chemicals in commercial leather cleaners that you could be storing in your home, inhaling, or allowing to touch your skin. 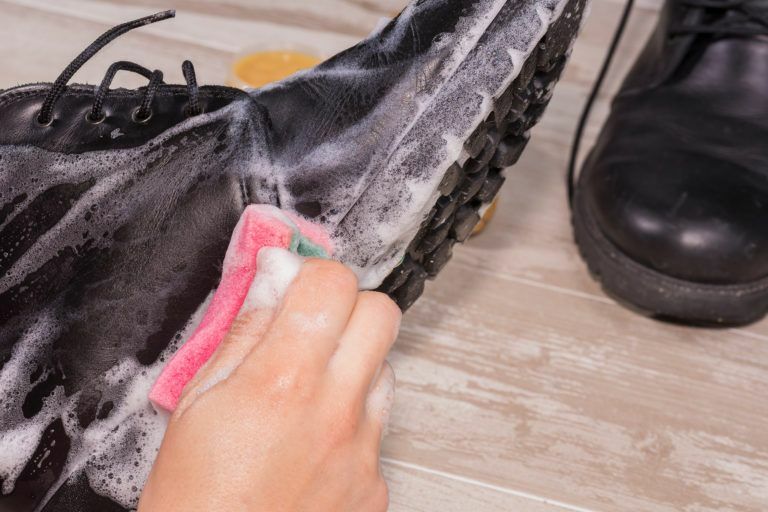 If the leather you want to clean is unfinished like a baseball glove, or has a soft nap like suede, you’ll have more trouble cleaning it yourself; the method below may not work, and will probably damage the leather. First, get your supplies together: you’ll need gentle hand soap (in the interest of keeping this project green, I grabbed a bottle of Method Hand Wash out of my bathroom), olive oil, and a few soft, clean rags. You’ll need water, too, but you can get that straight from the tap. Then, before you jump into cleaning your whole couch or that stain on the front of your jacket, it’s important to test the cleaning method from start to finish in a small, hidden place, just to make sure it won’t lighten, darken, or dry your specific piece of leather. Once you’re ready to get started, you’ll need to prepare a rag by dampening it and applying a little soap. 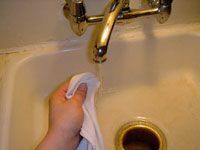 Get the whole rag wet if you’re cleaning a large area, but for small stains it should be sufficient to run a corner of the rag under the tap. Either way, remember that the rag should be just slightly damp, not soaking wet; squeeze out any excess water before pumping a small amount of hand soap onto the rag. Rub the rag against itself a little to work the soap into the cloth before you begin cleaning. You don’t want to apply a glob of soap to a piece of leather. Instead, gently rub a light lather onto the leather until it appears clean. Next, slightly dampen another rag to wipe any soap residue from the leather. 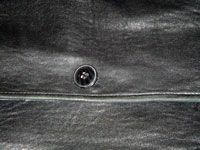 Because even finished leather is not completely water-repellant, you should never rinse it with a very wet rag or by running water directly over it. Using a rag with a minimal amount of water on it protects the leather from absorbing enough water to become damaged. Use a dry rag to remove the light film of excess water that may be on the surface of the leather after rinsing.Before moving on to the next step, it’s a good idea to also let the item sit for a few minutes to air dry in case the leather has absorbed water during cleaning. 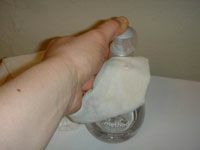 Finally, you should always condition leather after cleaning, since the soap will have removed some of its natural oils. This is where the olive oil comes in. 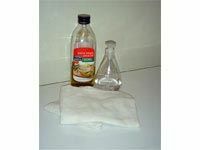 Put a very small amount of olive oil on a dry cloth and rub it into the leather. Using too much oil will make the leather greasy or sticky and attract dirt, so it’s crucial to apply only a tiny amount; if the leather is darker or shinier after oiling, you’ve used too much. 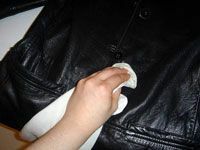 I was very happy with this method of cleaning leather; when I finished, my jacket looked exactly the same—except, of course, it’s clean now. Leather is a natural product, right? Well, not so much anymore. Animal hides provide the raw material for leather, but that’s where “natural” ends and “environmental nightmare” usually begins. And “natural,” unfortunately, is not synonymous with “cruelty-free.” Animals raised for leather live in the same deplorable conditions as animals raised for meat—and they aren’t necessarily the same animals. That means leather products are not simply a conscientious use of the skins of animals that were going to be eaten anyway. Then, once the hides enter the tanning and finishing process, they are bombarded with acids and decidedly unnatural chemicals. The leather-making process uses large quantities of fossil fuels, contributes heavily to greenhouse gas emissions, and creates wastewater full of sulfides, heavy metals, and carcinogens. Fortunately, though, some leather companies are making an effort to limit their environmental impact. For most, that means using alternative energy sources, tracking their greenhouse gas emissions, recycling water needed for production, treating wastewater before releasing it into the environment, and using leather pieces that would otherwise be wasted. One company, Organic Leather, bases its entire business on being environmentally friendly. They only use recycled leather and hides from animals that were raised organically or on family farms for the meat industry, and instead of chemicals, they process the leather with smoke or natural tannins and oils. These processes are drawn from traditional leather making and provide a rare opportunity to use leather products guilt-free. Montana Pitch-Blend offers a range of products for various leather cleaning and conditioning situations. I like this company because they divulge their ingredients clearly and without hesitation, and those ingredients are primarily pine pitch, mink oil, and beeswax. 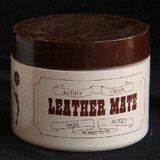 Leather Mate is a one-step leather cleaner and conditioner made from lanolin, carnauba wax, and other natural compounds. It’s a biodegradable product with a 50-year history. Oakwood Liquid Leather Cleanerand Leather Conditioning Cream are Australian products containing an array of natural oils and waxes, including tea tree oil, beeswax, eucalyptus and emu oil (who knew?). These sound like they would make your leather both look and smell pretty. 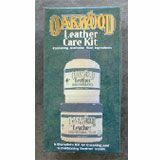 You can buy Oakwood Leather Conditioner from Amazon.